Culinary touchstones inspire new creations. Savoy cabbage in the crisper drawer. Excess stuffing from a stuffed mushroom cap appetizer. 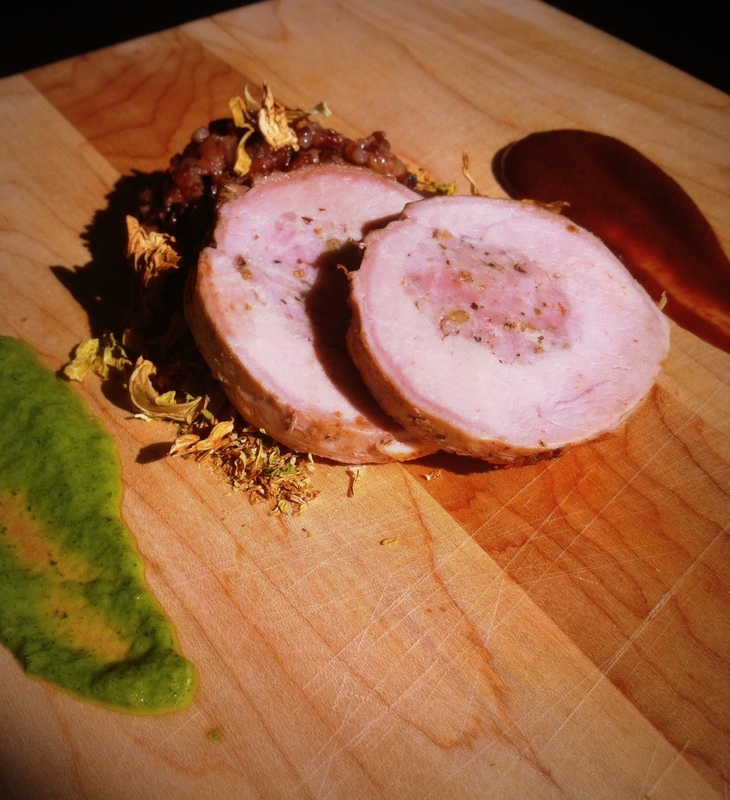 A pork tenderloin. The memory of stuffed cabbage rolls. Cabbage leafs boiled and then filled with a small serving of minced meats and seasonings exist in countless cultures across the globe. The Polish immigrants to Chicago called these Golabki, “little pigeons” or “little doves”. We could have simply placed a tablespoon or two of our mushroom stuffing and rice in the par-boiled cabbage, rolled up the cute little packages and baked them into delicious morsels. But Great Lakes Cuisine is not just tradition. It’s also about asking – Where else can we take this? Here is where we took this. 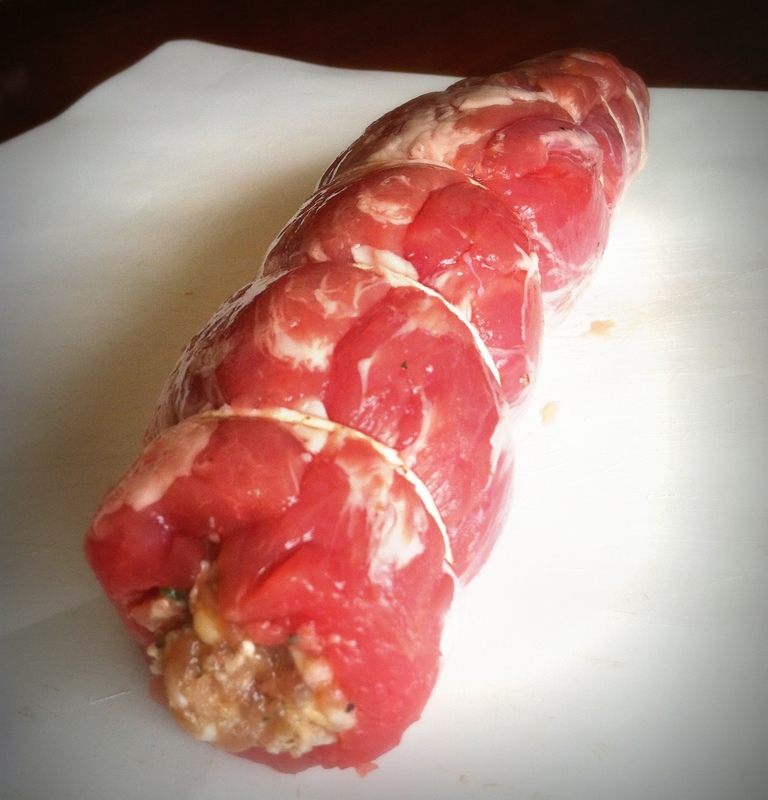 Instead of stuffing the cabbage leafs, we stuffed pork tenderloin with the mushroom mixture. Served the roasted pork pinwheels on a bed of red rice with chèvre and dried mushrooms. We oven roasted the cabbage into flaky, nutty chips with flavors slightly reminiscent of rye bread and concentrated cabbage. The oven dried greens we have done before with kale and chard. 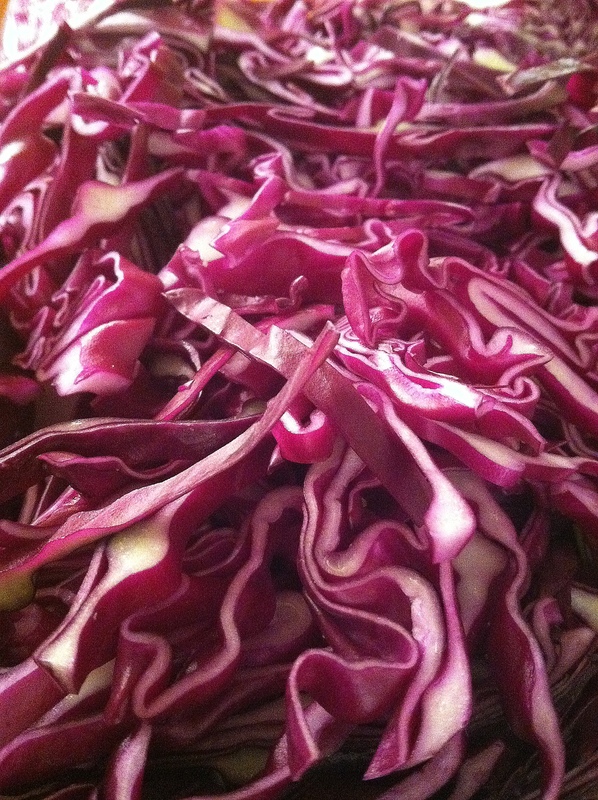 Taking advantage of an oven set to 250°, this time we also dried radicchio, endive, and even red cabbage sauerkraut. 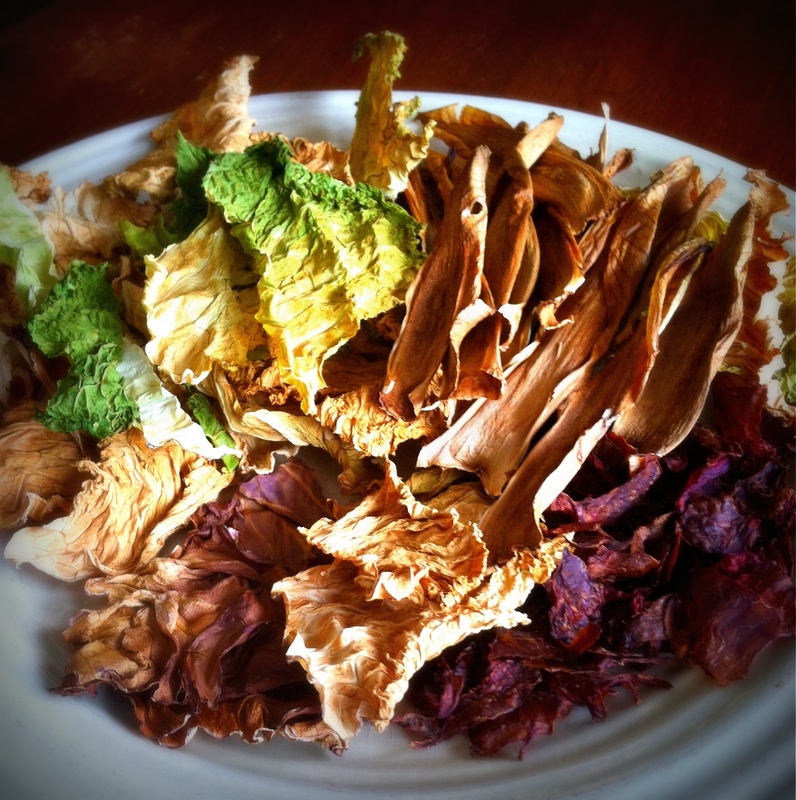 The radicchio was uninspiring, largely flavorless and the red color faded to brown. The endive was bitter. 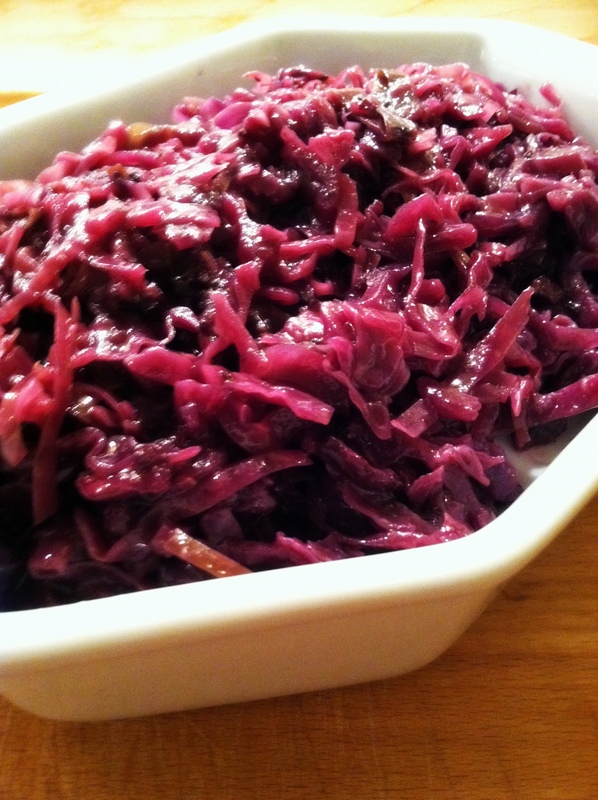 The red cabbage sauerkraut had caramelized, but still retained a lovely sour tang. The dish is earthy and nutty, but misses a bit of the “green” look and flavor of stewed cabbage, so we brought a dash of green to the plate with pureed pea shoots. In advance: Heat oven to 250°. Separate the cabbage into individual leafs, remove the thick stem of the leaf, lay in a single layer on a baking sheet, and roast for 2 to 3 hours or until just shattering crisp. Set aside. They’ll look something like the plate pictured above. Place the bread in a small bowl and top with milk or cream, allow it to absorb completely, approximately 30 minutes. Place the sausage, copped mushrooms, pancetta, soaked bread, oregano, basil, salt and whisked egg in mixing bowl and combine well. Soak the dried mushrooms in 1 cup of hot beef broth, let rest for 30 minutes, then drain and reserve liquid. Chop mushroom and onion. Heat olive oil over medium heat in large stock pot, add mushrooms and onion, and cook until onions are translucent. Add rice to pan and toss to coat. Add remaining beef broth and strained reserved liquid. Cook for 40 minutes or until tender. Stir in butter and chèvre. While rice cooks, heat water and wine in a small saucepan until boiling. Add diced shallot and simmer for 30 minutes. Return to a boil and add pea shoots, cook for 2 minutes pressing pea shoots down into boiling water. Remove and immediately add enough ice to chill the mixture quickly, about 3 cups. Strain and remove ice. Puree the shallots and pea shoots in a food processor with olive oil until smooth. Set aside. While rice cooks, heat oven to 450° and heat butter in large-oven proof skillet over high heat. Sear stuffed pork on all sides and place in oven. Roast for 20 minutes or until center reaches 160°, cover and let rest 5 minutes. To plate: scoop of mushroom red rice, topped with slice of stuffed pork tenderloin. Dot the edges with pea shoot puree and scatter cabbage leaves. In the picture below we also added dots of the red cabbage sauerkraut, which we pulverized and then incorporated into beef gravy. An alternative plating: the next day we rolled the cold slices of pork in a thin coating of the red cabbage sauerkraut purée, then rolled them in crushed cabbage leaves. Yes, this a lot of steps, but in the end it was more about process than a recipe. It was more about ideas, approaches, experiments. This was all about tradition as inspiration. My grandmother on my mother’s side was German, and my great grandmother was really German, Bavarian royalty somewhere in the lineage. I think that may explain why we served the sweet and sour red cabbage dish known as Rotkohl with our Thanksgiving turkey. I have taken up the tradition and modified it a bit over time. The Winter Farmers Market in Milwaukee provided an opportunity to pick-up a couple key ingredients. The red cabbage and onions came from Pinehold Farms and the bacon and a beautiful smoked pork shank were products of Lotfotl Farms (the name stands for Live off the Fat of the Land). We are using bacon lard and bacon “broth” generated by using our oven roasted bacon technique detailed here. Our bacon was used for BLTs the night before. 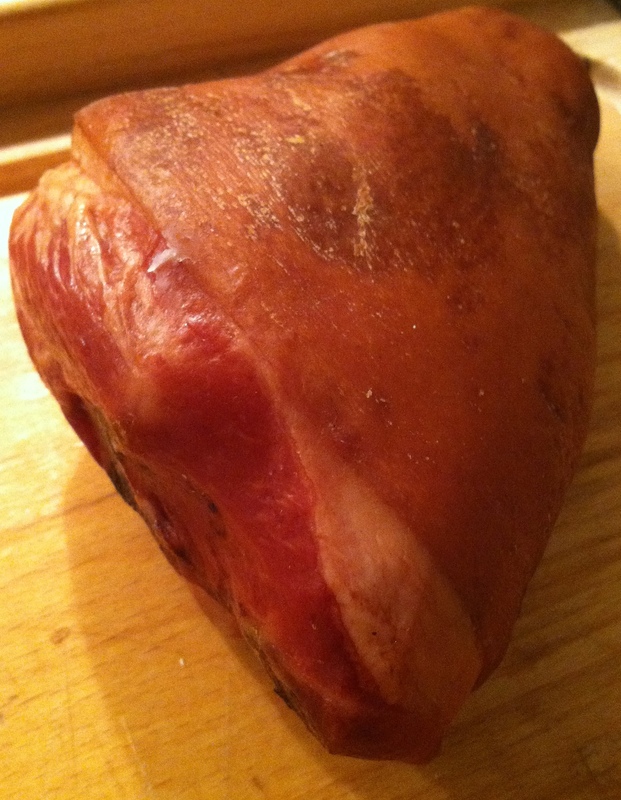 Carefully removed the rind of the smoked pork shank in the largest pieces possible, and discard pieces smaller than 2 inches in size. Carve meat off the shank and dice. In a large stock pot over medium high heat, place the bacon lard, shank bone, skin pieces, shank meat. Allow to brown for 2 minutes, but do not burn. Add onions and sprinkle with salt. Reduce heat to medium and caramelize and soften onions, about 10 minutes. Add a dash of water if they begin to burn before softening. When caramelized, add bacon “broth”, water, and wine. Bring to a boil, then reduce to a low simmer for 1 hour. While pot comes to a boil, prepare spice packet by placing next 5 ingredients into a pouch made from cheese cloth and tied closed (or use my preferred method, unbleached tea bags). Place spice packet into broth just for the last 30 minutes of simmering and then remove. Remove the bone and large skin pieces and cut off any loose meat from the bone and return diced meat to the pot. Taste broth for flavor, and add salt if needed. It should be as salty as a homemade chicken broth. Return pot to a low boil and add grated apple, cabbage, vinegar and sugar. Cook for 30 to 45 minutes, until softened but retaining some crispness. You will have to determine the level of texture you prefer, but this should not be overly soft at this stage. Remove from heat and place into a large, non-reactive container for storage overnight. The next day, drain cabbage, retaining 1 cup of liquid. Mix corn starch with liquid.Bring vinegar and sugar to a low boil in a medium saucepan over medium heat until sugar is dissolved. Add liquid to vinegar mixture and bring to a boil to thicken. Add cabbage and heat through. Adjust flavors with vinegar, sugar, or salt as needed. The resultant dish should have a meaty, smoky flavor with a sweet/sour finish. Serve with rich beef dishes, alongside game meats, or as my family does, alongside the Thanksgiving turkey.